Software firm FamCom Inc has launched Kenya Kenya on iTunes, the first iPad app created for the award-winning book series, ‘Jadyn and the Magic Bubble’. 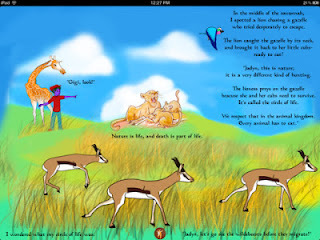 Kenya Kenya app is a fully animated and educational children’s story aimed at children aged between 6 and 12-years-old teaching them on how to live consciously. The app is based on LA-based author Brigitte Benchimol’s book, ‘Jadyn and the Magic Bubble’. In the book series, Jadyn’s Magic Bubble takes him on an unexpected but adventurous Kenyan safari where he befriends a giraffe called Gigi. Gigi takes him on a fun-filled journey through the Savannah, unraveling the mysteries of the animal kingdom, and the truth about the uncertain future facing many species. Through his amusing misadventures, he leans how to treat and preserve our environment. The story touches on essential curriculum subjects such as Reading, Geography, History, Social Studies, Science, and Art. The app comes with various appealing features that include a digital colouring feature that allows a child to colour the Kenyan Landscape and animals with a finger. Other interesting options offered include audio-only narration of the story, a read-only option, and an option to record ones narration of the story and later play it back in her own voice and language. The app is available for download at all online iTunes stores worldwide at a price of USD $5.99.